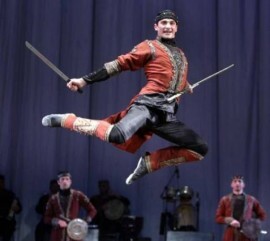 Download an live recorded mp3 of Surrey Brass playing Khatachurian's "Sabre Dance"
The "Sabre Dance" is a movement in the final act of Armenian composer Aram Khachaturian's ballet Gayane, completed in 1942. It evokes a whirling war dance in a Kurdish dance, where the dancers display their skill with sabres. Due to its exceptionally exciting rhythm, the Sabre Dance established a place for itself in concerts. Driving, exciting music. And it gets faster towards the end. This makes a pretty cool ringtone to put on your phone! If this whets your appetite for this great composer, try some of his other music too!